This site where this Marian statue is located is currently being redeveloped as a major new tram stop on the new Luas Cross City line. The statue is properly known as the ‘Queen Of Peace’. There are many ‘Marian Statues’ throughout Ireland but the majority are in Dublin. The one in my photograph is a bit different in that it was erected in 1953 by railway and bus workers of CIE, a state transport company, on company property. I do not know who maintains the installation but it is in good condition. 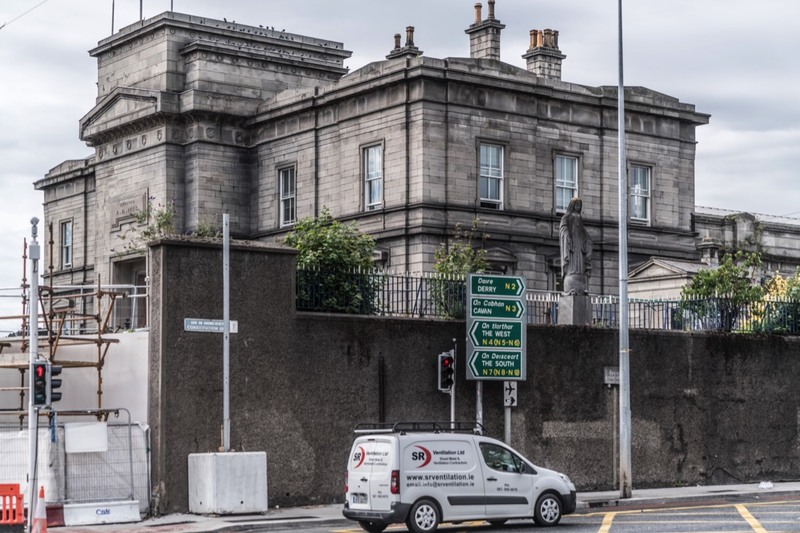 Also I do not know if it will be located within the public plaza associated with the Luas Stop but I cannot find an mention of it in the schedule of statues and monuments that were subjected to storage or restoration. At this stage I am assuming that the statue will remain as it is. In many photographs that I have seen it appears to be painted white but as you can see it is now unpainted stone or concrete. The has been a change as It would appear that there will be a separate stop known as the Grangegorman Stop located along the Western perimeter of the Broadstone Bus Depot.